Are you thinking of buying your first home in Mississippi? Would you like information on a variety of programs – some even offer a free gift of money – to help you purchase that first home? If you answered yes to these two questions, there is great news for you. The state of Mississippi provides programs, including free grant money, for its residents who need help with the down payment and closing costs. This money comes in the form of state grants that range in size up to $14,999.00. This is free money that shouldn’t be passed up! There are also several local programs in various Mississippi cities that offer incentives to first home buyers. It will be well worth your time to educate yourself about the programs that the State of Mississippi provides. The agency in Mississippi that provides assistance is The Mississippi Home Corporation. There is currently only one grant program available: Down Payment Assistance Program. 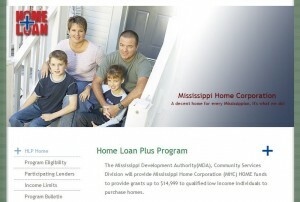 To find out more about this program, please visit the Mississippi Home Corporation website. To navigate directly there, simply visit here. In addition to the grant programs described above, the U.S. Department of Housing and Urban Development provides home buyer assistance and programs to Mississippi residents. There are multiple grant programs designed specifically for people that meet certain requirements, such as grants for people with disabilities so they can continue to live independently at home. It is worth visiting HUD’s website to see what assistance is currently available. For your convenience, simply go to this page. Habitat for Humanity is a non-profit Christian organization that seeks to eliminate poverty housing throughout the world. Habitat works with all people to help make decent shelter a matter of conscience and action. Partnering with families, volunteers, donors and friends, we help provide decent, affordable housing. This entry was posted in Down Payment Assistance, First Time Home Buyer Grants, First Time Home Buyer Info, First Time Home Buyer Programs and tagged Biloxi Housing Authority. Bookmark the permalink.